Tarte tatin is a classic French upside-down apple tart. One bite and it’s clear why the tarte tatin is an enduring classic. Unlike apple pie which is often overpoweringly cinnamon-flavoured, tarte tatin is all apple with a hint of caramel. Tarte tatin is made by caramelizing apples in a pan, then draping the apples with pastry dough, then finishing the tart in the oven. It is flipped over for presentation so the pastry becomes the base of the tart. If you’re looking to impress, tarte tatin has much more impact than an apple pie. I also personally prefer the flavour and texture of tarte tatin over apple pie. And despite a seemingly complicated set of instructions, it’s no more complicated than making an apple pie. The Fine Cooking recipe I link to above is one of the best written recipes I’ve ever seen. 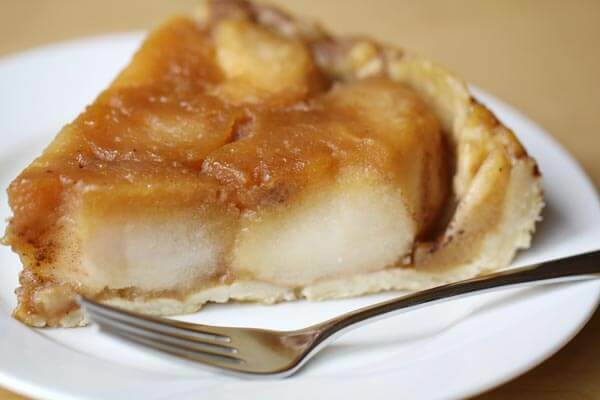 It is very clear, and includes a couple of tricks to ensure that your tarte tatin comes out looking better than many professional tarte tatins. One of those tricks is caramelizing a few extra apples in an extra frying pan, so that as the apples shrink, you can insert the extra apples so that your tart stays densely packed with apples. I used Cortland apples, and the result was excellent. The apples softened nicely, but remained very much intact and didn’t go mushy. So give this tarte tatin recipe a try next time you need to a dessert to impress. Equally good with or without the vanilla ice cream.